Hope you've had a great start of the week, our's started with back to school for my son. I can't believe he is already in second grade!!! Where does time go!? We've had such a busy week last week, going on a mini vacation before the end of summer break and then had to get a couple more things for school...I really thought I was going to have to miss this week's challenge. Glad I found some time for it! I know you all have lots of bits an pieces laying around so this is your time to use them! Hope you'll all play along this week! 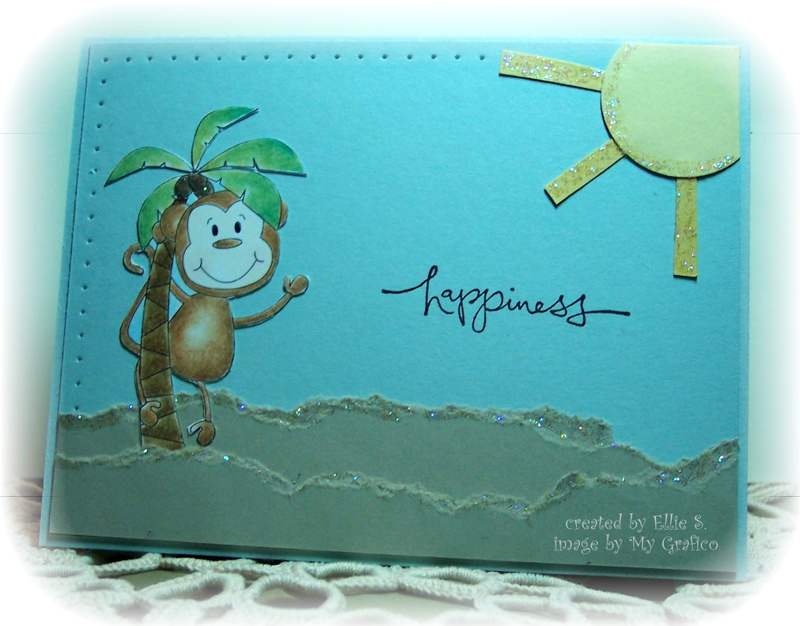 Here's one card I made using the super adorable Monkey Fun Set by Primsy Doodle Designs, from our generous repeat sponsor My Grafico. I just love that big smile! It's been printed on some couture 80lb cards stock and then colored with derwent coloursoft pencils and blended with baby oil. 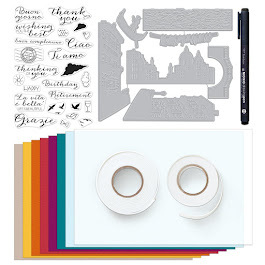 I've used only card stock scraps on this, no designer papers or ribbon scraps (not that I don't have any, I just couldn't decide which ones to use so I decided to make a "scene" instead. I tore some sahara sand card stock for a sandy look ( at least that was my intension LOL), then added a little bit of stickles glitter to the torn edge and some to the sun and coconuts. To finish it off I did a little bit of paper piercing. Here's the other card I made. This one uses a brand new image (new to me) from Sassy Cheryl. It's been printed on couture 80lb CS and colored using derwent coloursoft and baby oil. My paper scraps are from stampin up and I believe the other Designer Paper is from a short stack from DCWV. Sentiment is from stampin up. I added some stickles glitter, ribbon from my never emptying ribbon scraps jar and then I did some sewing with my janome mini. Hope you liked the cards and be sure to check out the rest of the DT's work, they all did an amazing job this week again. Hopefully you'll get to play along this week. 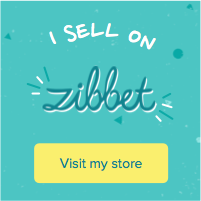 My Grafico is giving away one set of winner's choice PLUS 30% off one order. How fun is that!! 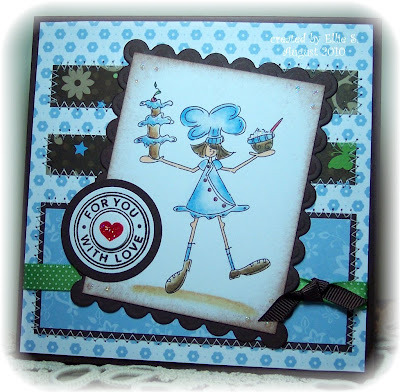 ETA: Lora from Lora's cards has several cute stamps, christmas sentiments and alphabet stamps for sale on her blog. They are all marked about half prize what the sticker says. 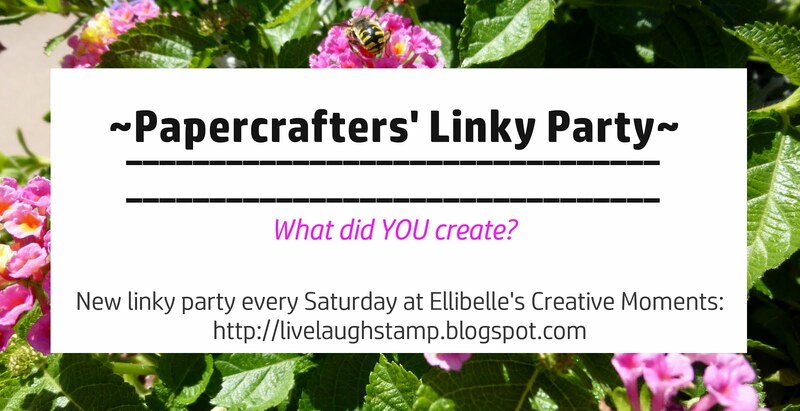 Check out these links below to take a peek. Just adorable cards Ellie! Love how you did the sand in the first card. Love your scene in the first card. So cute! and wow!! Two cards in a week? Must have a little more time with your son back in school? Hope you are doing well! ack! I love that cheeky monkey!!! Sassy Cheryl's are some of my fav images!! You have done a beautiful job on both these cards...way to use up those scraps!! Both of your cards are wonderful. Love the detail in both of them. Your stitching looks awesome!!! It's always fun to produce work that you can use your scraps on and not spend all day at the store looking instead of crafting! Great job! Ellie what a clever idea. Both cards are wonderful. Good idea with the Sahara Sand for the sandy beach and a good job on the stitching. 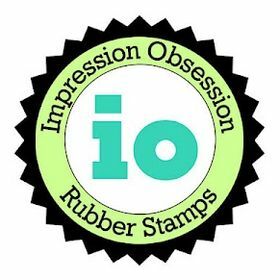 Glad you joined the Stampin B this week. Both of these are AMAZING!!! TFS with us at SMC! Two fab cards. Love the cheeky monkey up the tree - thanks for joining in with Daring Cardmakers. 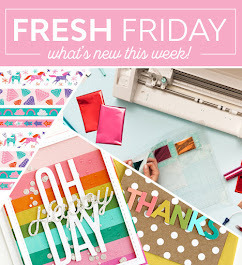 Thank you for stitching with SMC this week! Fabulous cards great choice of images. Cute cards, thanks for playing! Thank you so much for entering the Allsorts challenge this week, good luck!